Marietta Divorce & Family Lawyer | Daryl L. Kidd, P.C. It’s a popular misconception that marriages end in divorce. Our experience has taught us that marriages end long before either spouse files for divorce. Viewed in that light, divorce can be a constructive process that fixes problems for individuals and families, allowing them to restructure their lives in a way that’s better suited to their desires and aspirations. 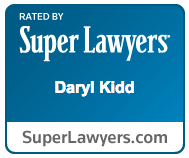 For more than three decades, The Law Offices of Daryl L. Kidd, P.C. has brought a keen legal intellect and sincere empathy to the practice of family law. Too often, lawyers in Cobb County approach marriage dissolution with an us-versus-them attitude, which can be destructive for families and individuals looking for a fresh start. Instead, Daryl Kidd works with clients to achieve settlement terms and court orders that prove workable over the long term. Negotiation — In traditional negotiation, attorneys for each spouse attempt to come to an agreement on the ancillary issues of the divorce (division of assets, spousal support, child custody and support, etc.) before resorting to trial or while the trial is ongoing. Mediation — This alternative to a full trial litigation allows spouses to work cooperatively with a neutral third party. The mediator guides divorcing spouses toward a mutually beneficial agreement, but does not render a decision. Arbitration — This streamlined form of litigation allows spouses to try issues before an arbitrator who renders a decision. The process is adversarial, like a trial, but saves time and expense. Litigation — When couples cannot resolve disputes through mediation or arbitration, a legal challenge before a judge may be necessary. Our firm also appears in court for enforcement and modification motions. Daryl L. Kidd and his staff approach each client and each family as individuals with unique challenges, dynamics, issues, histories and future concerns. (Our concern with families in crisis extends to representing children in contested cases as Guardian ad Litem.) After taking time to get to know you, our firm can pursue workable settlement terms and court orders. Daryl L. Kidd strives to treat clients and opposing parties with respect and dignity even when emotions run high and the stakes are enormous. Yet our cordial demeanor should never be mistaken for lack of resolve; we are resolute in our efforts to secure your goals for the future. The Law Offices of Daryl L. Kidd, P.C. has served the Marietta area for more than three decades. If you’re considering divorce or have any other family law issues to discuss, call us at 888-532-8543 or contact our office online. We offer a reduced rate for initial consultations and have flexible office hours during the week to accommodate your schedule.